Sometimes you come across something that you just want to share with everyone because it`s just wonderful. That is exactly how I feel about this wonderful website I discovered Waltzing Matilda – which offers many free beautiful and inspiring color pages. 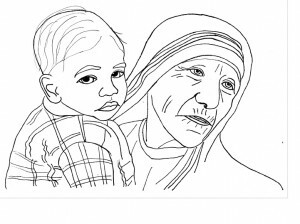 You no longer have to spend hours each year looking for saint, feast or sacramental coloring pages for various feasts or catechism lessons- she has them all right here on her blog and she offers them for free for personal use! They are beautifully drawn! Enjoy!